FEATURED PERFORMERS: Click on the names below for film clips and bonus material. 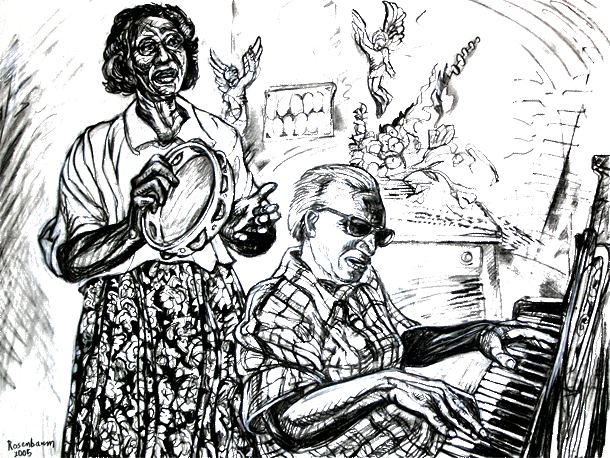 97-year old blind gospel singer Fleeta Mitchell still sings old spirituals and gospel songs and plays piano vigorously; and she recounts vivid memories of her late husband, whom she met at the Georgia School for the Blind. In home and at church Mother Mitchell is joined by other singers including her close friend, Rev. Willie Mae Eberhart of Athens. Rev. Willie Mae Eberhart of Athens, is a powerful singer and eloquent speaker on faith, and on the overcoming of oppression. South Georgia country blues singer and guitarist, Precious Bryant, shares old and original songs that speak to a hard life and enduring spirit. The film also includes archival footage of Maybel Cawthorn, a banjo picker who served hard time in her 80s for selling marijuana. Mary Lomax, an octogenarian of Habersham County, is arguably the finest traditional unaccompanied American ballad singer to emerge in the 21st century, having learned her songs and ballads, some 300 years old, from her father as a child. Bonnie Loggins, is not only a singer but a maker of songs and poems, and a fine and idiosyncratic self-taught painter. The Myers Family and Friends, a Blue Ridge Mountain group that has continued a tradition of family and neighborhood music-making. Ed Teague currently plays with The Myers Family and Friends and shares his perspective on the role of women in preserving traditional music. The film includes archival footage and photographs from a visit to the Blue Ridge Mountain farm of the musical Eller family. The film includes archival recordings and photographs of Doc and Lucy Barnes. Art Rosenbaum discusses his documentary, “Sing My Troubles By,” in this segment of his weekly radio program, “Backroads and Banjos” on AM 1690 (Atlanta).